Last Kiss is published by Hachette Ireland on 7th August in trade paperback and e-book format. It is her best so far.....and that is saying something, as I loved both previous books!! 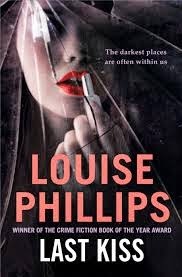 Love crime fiction and I'm really looking forward to reading this one. It is soooooo good. Lock your door while reading, as you will NOT want to be disturbed! You always have such great book recommendations! I really want to read this book! Top class thriller. You really have to get it!!! Just finished this morning! By far the best of the three and I didn't think they could get better! A genius writer!